More policies related to the Leichhardt Saints FC are available from the drop down policy menu above. Please make sure you read them so you are familiar with the requirements of the Saints, CDSFA and the Football NSW. Leichhardt Saints encourages participation in Football, and expects players to be given equal opportunities on the field to develop skills to their best potential. Regular attendance at one training session per week is considered reasonable and a fair expectation for team ‘membership’. Access to Playing Fields – The Club only has limited access to the playing fields and with many teams practicing, an ‘additional’ team practice session may compromise access by others. Players other commitments – Many players have a number of other sport, music and educational commitments on at other times. Parents’ expectations – Many parents have selected the Saints for its fairness, family friendly orientation and on the suitability and frequency of training times. Accordingly, the Club considers attendance at one training session per week as a satisfactory commitment and entitles a player to equal consideration at match time. Subject to the display of equal commitment (attendance at training and games), all members of any team (regardless of age or division and individual player ability) should enjoy equal time on the field. The policy of equal time for all players still stands. Contact the Club to discuss suitable extra times and/or locations that will not compromise training access for other teams, and thereby to ensure all players are covered by Insurance. Increase in the length of the existing single training session (for older teams). NB: The Club Policy on the Rotation of Players is, and always has been, that each player is entitled to similar amounts of game time during the course of the season, regardless of division. This ruling may be suspended if the player regularly turns up less than 15 minutes before the start of a match, does not attend training, or clearly misbehaves. For finals and grand finals, each regular player present must be fielded. It is up to the discretion of the coach and/or manager for how long they play. Coaches and managers are made aware of this at the start of the season. 2011 Leichhardt Saints Football Club Committee. Leichhardt Saints Football Club (LSFC) is a family oriented sports club. We believe in promoting participation in our game, equal opportunity for all players, development of football and team skills, and above all, enjoyment of the game. The Club believes that placing players in a grade appropriate to their skill level plays a significant role in achieving these objectives. The grading policy aims to promote these objectives, and is not about winning. have an equal opportunity to contribute to the team’s performance. These conditions provide the best circumstances for development of football and team skills and enjoyment through participation and achievement. The Club recognises that individual players have different motivations for playing football ranging from highly competitive to social recreation. Through appropriate grading and player placement the Club aims to cater for all players and believes that everyone can benefit from the grading process. Whilst the Club encourages all players to take part in the grading/player placement process, it is not compulsory. Players will have the opportunity to play with friends in non-graded teams whenever this is possible in conjunction with the grading process. U6/U7: No specific grading is proposed. However the Age Coordinator will be responsible for the placement of players in teams and will take into account past experience (where applicable) and other requests entered on the Registration form. Requests may include for a player to move up or down teams. Parents are reminded to consider the Grading Policy Statement, which states that players will have the best opportunity to develop if they play and train with others of similar ability. Players returning to LSFC will be given priority in the player placement process and no player will be required, if unwilling, to move teams in U6/U7. Player placement/movement will be applied within these parameters by the Age Coordinator in consultation with Coaches where appropriate. Grading policy: Half the teams in each age group will be graded. If there are four teams in an age group two will be graded. If there are 3 teams the coaching Director will decide if 1 or 2 teams will be graded. If there are 5 teams the coaching Director will decide if 2 or 3 teams will be graded. Grading will necessarily be subject to numbers participating. LSFC encourages all players to participate in grading even if nominating for a non-graded team. Refer to LSFC’s Grading Policy Statement. Implementation: The grading process will be conducted by the LSFC Coaching Director and his/her nominees. The Coaching Director will endeavour to have at least one other grading panellist who is independent of the age group. Consultation with coaches will be at the discretion of the Coaching Director. The Age Coordinator will assist in managing the grading process and all parent inquiries will be addressed to the Age Coordinator. The decision of the Coaching Director is final. Should the Age Coordinator be unable to resolve a dispute regarding the grading process the decision of the LSFC President will be final. Games and training involving adults should be postponed or cancelled at 37 degrees C.
Games and training involving children should be postponed or cancelled at 32 degrees C.
Below are a selection of very informative documents. Strongly recommended reading. The weather conditions experienced in Australia, together with recent events on the South Coast when a cricketer was killed, has led to the development of a Soccer NSW Policy based on information primarily supplied by the Centre of Sports Medicine Research and Education and the Commonwealth Bureau of Meteorology. Whilst lightning may be fascinating to watch, it is also extremely dangerous and underrated. During the past 30 years, based on documented cases, lightning has killed an average of 73 people per year in the United States. In Australia, there has been an increase in the number of casualties resulting from outdoor sport and recreational activities. On average, in Australia, 10 people a year die from lightning strikes. Statistics show that around 25% of people killed by lightning are playing sports such as golf, cricket or hockey. Three years ago in a park at Merrylands, five children were struck by lightning while playing. An average lightning bolt carries 10,000 to 30,000 amps – an average radiator draws 10 amps! Thunderstorms are most likely to develop on warm summer days and will go through various stages of growth, development and dissipation. During the thunderstorm, each flash of ‘cloud to ground’ lightning is potentially lethal. Lightning can travel 80km before it strikes something. If a person is in the path of that lightning discharge, it could prove deadly as the current associated with the visible flash travels along the ground. Although some victims are directly struck by the main lightning stroke, many victims are hit as the current moves in, and along the ground. The ground emits charges that shoot up to meet the leading strikes and the high voltage gradients cause currents to flow in concentrated channels on the surface or within the soil. It is therefore evident that the potential exists for a large number of people to be struck by lightning as they leave themselves vulnerable due to inadequate protective action. Contrary to popular belief, lightning does not always strike tall objects – it can strike anywhere and can strike repeatedly. Metal objects do not attract lightning, although they may channel it if the strike is already a few metres away. There is clearly a need for all clubs and associations to implement an action plan, and adopt all precautionary methods available, to prevent any casualties. A designated person should be responsible for monitoring the weather conditions in the area at which the ground is located, to provide awareness at individual club level. Where possible, the person should attempt to ensure that all players, officials and spectators are moved to safe areas. The monitoring should begin the day before a scheduled match to confirm whether or not thunderstorm warnings have been given by the weather forecasters. If so, increased awareness of possible lightning strikes should continue on the day of the match until the game is over and the crowd have dispersed. Should thunderstorms be prevalent on match day, the ’30-30′ rule is to be used in order to determine whether a game should be suspended (to include delaying the commencement of the game) and when it is safe to resume play (to be determined by the Referee]. When lightning is sighted, count the time until thunder is heard. If that time is 30 seconds or less, the thunderstorm is within 10km and is dangerous. As most experts believe that the ‘safe’ distance is no less than 10km, all people at risk should be seeking, or already inside safe shelters. This is the time at which matches should be suspended. This rule is one of the most practical techniques for estimating the distance to lightning activity and is based on the fact that light travels faster than sound. As sound travels at a speed of around 1km every 3 seconds, the time that elapses between the flash of lightning and clap of thunder can be divided by 3 to give a measure, in kilometres, of how far away the storm is. The threat of lightning continues for a much longer period than most people realise. It is imperative to point out that sunshine or blue sky should not fool anybody into thinking that it is safe, and you should remain alert to the possible return of the storm. Using the ’30-30′ rule, the distance of the storm should be estimated before allowing play to continue. There is not a place absolutely safe from the lightning threat, however some places are safer than others and, where practicable, people should be moved to a safe structure as soon as possible. The best option is a large building with electric and telephone wiring and plumbing to provide a safe pathway for the current to the ground. Once inside, stay away from corded telephones, electrical appliances, lighting fixtures, radios or microphones and electric sockets and plumbing. Mobile or cordless telephones are a safe option if the person and antenna are located within a safe structure. Do not watch lightning from open windows or doorways. Inner rooms are preferable. A solid building or a hard top [metal bodied) vehicle [including buses) that guides the lightning current around the passengers, is an alternative. Shelter should NEVER be sought under a small group (or single) of trees, in an open field or in small open structures such as rain/picnic shelters. People should stay away from metal poles, fences, clothes lines etc and should not use umbrellas or mobile telephones. Metal is not to be touched. If located at a ground far removed from a safe shelter, preventative measures can still be taken. If lightning is about to strike, it may provide a very few seconds of warning. If hair stands on end, the skin tingles and a ‘buzzing is heard from nearby rocks or light metal objects, lightning may be about to strike and a crouching position should be assumed (alone, feet together, squat down with head tucked and ears covered). When the immediate threat of lightning has passed, safe shelter should be sought. If the worst case scenario occurs and a person is struck by lightning, there are key first aid guidelines to follow. Medical care may be needed immediately to save a persons life. If at all possible, call ‘000’ at once. As all deaths from lightning arise from cardiac arrest and/or stopping of breathing, it is imperative that treatment is commenced as soon as possible. CPR or mouth-to-mouth resuscitation is the respective recommended first aid. If proper treatment is administered, most victims survive a lightning strike. Another myth is that strike victims retain electricity – they do not! However, lightning victims do often suffer severe, long-term debilitation. The most common symptoms are memory deficit, sleep disturbance, chronic pain, dizziness and chronic fatigue which may not be evident until some time after the injury, perhaps months later. It is therefore preferable that a qualified first- aider be present at games. Where possible, everybody present on a match day should be warned of the potential dangers of lightning so that all can be made aware of the safety procedures in operation. It is recommended that, where feasible, notices and safety instructions be placed in programs and on walls where clearly visible and obvious. It is recognised that a majority of grounds being used in NSW may be local government owned and that the individual council policies may assist, or preclude, such actions. Clubs and associations are encouraged to discuss this policy with ground owners in an attempt to gain signage approval. No lightning safety plan or policy will provide 100% guaranteed total safety, but every effort can be made to ensure that all preventative steps are taken. Provide warnings to all of potential dangers caused by lightning and indicate safety guidelines clearly. Makdissi, Michael & Brukner, Peter. Centre for Sports Medicine Research and Education, School of Physiology, Faculty of Medicine, Dentistry and Health Sciences – University of Melbourne, Victoria. (SUDS). Recommendations for Lightning Protection in Sport. The MedicalJournal of Australia. American Meteorological Society. f2DO2} Recommendations for Lightning Safety. The National Weather Service. Commonwealth Bureau of Meteorology. Severe Storms – Facts. Warnings and rotection. National Weather Service. [2OO3]. Lightning -The Underrated Killer. Benson, Simon. [2OO3). Playing it Safe When the Skies Flash Danger. The Daily Telegraph. Football NSW confirms to all members the following 2005 FIFA guidelines and FFA advice concerning the wearing of jewellery whilst participating in the game of football. 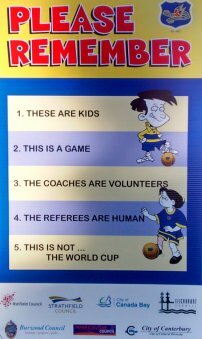 This information has been provided to Football NSW by Football Federation Australia and is confirmed to all Branches, Associations, Clubs and NSW Referee Branches as applicable to all competitions at all levels within Football NSW. This includes anti-discrimination bands, leather necklaces and any other loose wristbands. The taping of jewellery is no longer allowed (including earrings and wedding rings). Any player not complying with these regulations will not be allowed to play. It is important for a Referee to ensure that the player’s coach, manager and team-mates are aware of the player’s condition, together with any first aider who may comprise part of the clubs management. If a player is injured and is unable to speak, ensure that somebody checks whether they are wearing a medical bracelet or necklace.